The most popular motorized vehicle in the world. Ever. 80 million. Thats how many of these street urchins have been sold since its inception 50 some-odd years ago and thats counting only the ones built by Honda. Countless copies, some authorized and some not, roll along in first, second, and third world cities plying the streets doing their job ferrying people, goods, livestock, bundles of sticks and whatever else can be fastened to it. And what a machine it is, underwhelming in every respect, from its power to its chassis, and everywhere in between, and yet… people keep buying them. 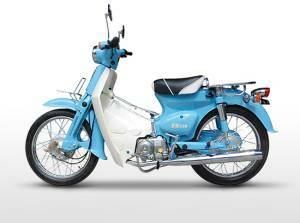 My first two-wheeled powered cycle experience was on one of these machines; a 1981 C70 Passport in aqua blue. Easy to ride, horrific to stop, and slow to do anything, it nevertheless was stone reliable, and did not seem to mind indifference to maintenance or care. In fact it tolerated quite a bit of abuse from two teenage boys as well as from an errant automobile turning left in front of it. It was my first two wheeled impression and I left thinking it needed more power and a better front suspension. It was promptly forgotten when I discovered Vespas and Lambrettas and all the tuning fun they offered. Fast forward a certain quantity of years: 2 strokes are long extinct and period Vespas and Lambrettas command a small fortune. New scooters are now 4 stroke as a general rule, at least here in California. There is currently a renaissance in the scooter scene, driven by economics as well as style. Vespa is now American owned and building twist and go scooters in an apparent blasphemous move against all that is sacred in the scooter world, while at least two Indian companies, Bajaj until recently, now LML, are building exact replicas of the last 2 stroke Vespa P200 series but with 4 stroke engines. Lambretta may or may not be in business depending on who you ask, but there are countless Pacific Rim companies importing their own models of scooters to fill whatever gap there may be in the market and insure total saturation. 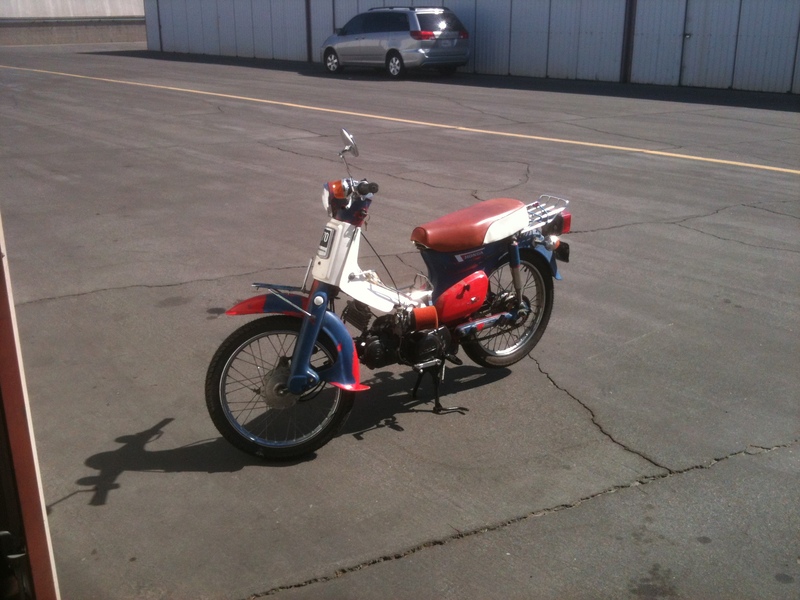 In all of this, the original Honda C70, or super Cub as it is called everywhere else, continues to be built but not sold in the US, while no less than two chinese companies sell direct and indirect copies here.The horizontal single lives on in Honda showrooms as the CRF50 pitbike suitable for small children and immature adults. Who says being immature is a bad thing? I have always lusted after a 4 stroke manual transmission scooter. First it was the Bajaj Chetak, now it is the LML 4t, known here in the USA as the Stella and sold through the Genuine Scooter Company. I was seriously considering the purchase of one when I mentioned it to a former Lambretta chopper builder (from England so he must be authentic). After discussing at length, he remembered a Honda Passport project one of his employees had given up on (yes scooter people do go on to own successful businesses). In the interest of saving money (I am in my senior year at Cal State LA) he suggested that the Passport might be available for FREE. Well, not exactly free, more like pay me something, later, someday. (If you remember). Thinking back to my teens, I was reluctant, yet intrigued. The Passport is quite possibly the worst handling motor scooter ever devised by man. The epicenter of this problem stems from the design of the front suspension and the anchoring of the front brake to the leading fork link. The earlier models had a floating brake hub located with a parallel link attached to the fork leg, much like the Harley Davidson Springer front fork, but with later models Honda decided to attach the hub directly to the link, resulting in an alarming tendency to slam the suspension to the top of its travel whenever the front brake is used, completely unsettling the bike and effectively limiting the fun quotient to zero while raising the pucker factor to eleven. The other problem with the Passport is the power, or lack of it. While these engines are unquestionably high performance in nature, easily exceeding one horsepower per cubic inch, there really is no replacement for displacement, so I thought. But truthfully, I recognized this as being one of those opportunities where things come full circle and you are allowed to relive your youth as an adult (an immature adult), and get to address the issues you had with something then, armed with knowledge and experience that didn’t exist the first time around. Was I up to the challenge? Does it even matter? I guess it didn’t, since I went for it. What did I have to lose? The Passport came with a parts bike, an early CT200 with the pushrod 90cc engine (who knew that Honda made pushrod engines for motorcycles? (Don’t answer that, I know now about the CG and CX series engines). It also came with brand new Michelin tires, a Lifan 140cc engine, a custom made big bore exhaust, and all DMV fees paid. If you are asking why the bike was free, it was because of a paperwork problem, and no it wasn’t stolen. After spending money and time on the machine, the owner couldn’t get it registered and gave up. I have experience dealing with the monolithic entity known as the California Department of Motor Vehicles, and having nothing to lose, I began the process. Making it sound easy by not divulging the details of how I got the bike through the process, I got license plates, and set to work. A general rule of thumb when dealing with vehicles that have paperwork issues is to not spend any money or time on them until you have paperwork for it in your name. 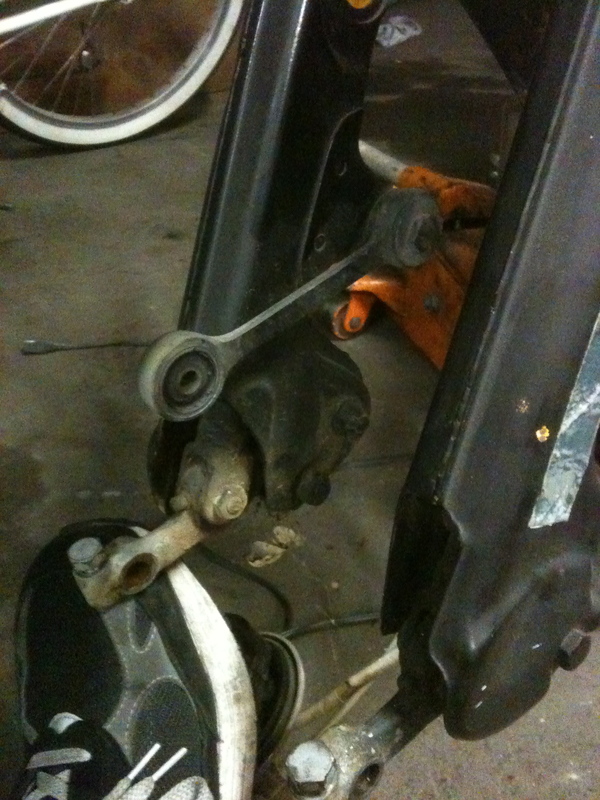 The first thing I did was tear down the parts bike to learn about what I was getting into. I noticed straight away that the CT200 had the infinitely more desirable floating front brake hub, and noting that the fork assemblies did not interchange, I set about figuring out how to put the guts of the CT200 fork into the Passport fork. Fortunately, through some grinding, shimming, and welding, I was able to get it to all fit despite the fork being a full inch narrower. I even used the CT200 front wheel which was a hair wider, allowing for a slightly wider tire to make the bike less twitchy. I have to tell you that this is the best modification anyone can make to a Passport scooter. It transforms the bike into something enjoyable and livable. Someone should make a kit to convert the brake to a floating hub. The entire process of making the Passport into something rideable took about two weeks, made quicker by the decision not to paint it (some may call that a mistake, myself included with hindsight). Unsurprisingly, there were a few glitches to work out. The first involved getting better throttle action with the replacement carburetor that came with the new engine- something better than a full 3/4 turn to get full throttle. After shopping around for a quick action throttle that would fit the smaller handlebar of the Cub with no success, I stumbled upon a 50¢ fix on the interwebs involving a pvc pipe coupling, a saw, and a file to remove the saw fuzz. 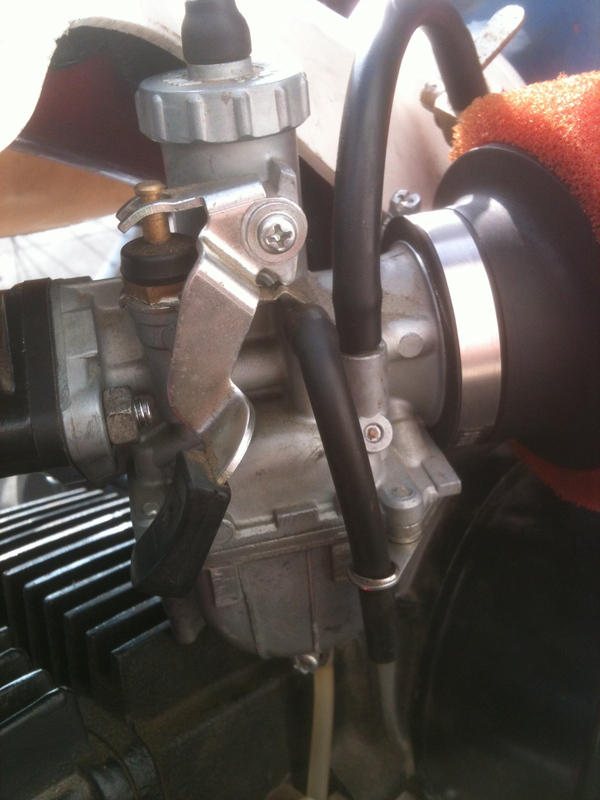 The idea works by wrapping a piece of the coupler around the groove the throttle cable rides in on the throttle tube, increasing the circumference of the tube and causing the cable to move further for the same amount of rotation. It’s a great idea, but unfortunately there wasn’t enough room inside the throttle housing. 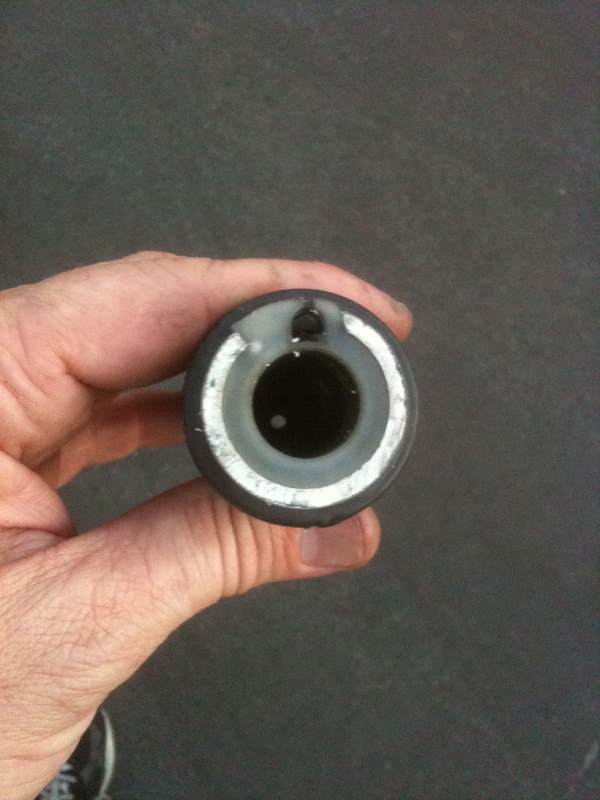 Undeterred, I then cut the thinnest sliver of pipe coupling and forced it into the groove for the throttle cable, which allowed the cable to run on top of the throttle tube rather than the groove. If this all seems confusing, just take my word that it changed throttle travel from 3/4 turn to 1/2 turn, which, for 50¢ and an hours time, is good enough. Heres a shot of what didn’t work, and a shot showing the groove that I ended up filling in with pvc that actually did work. 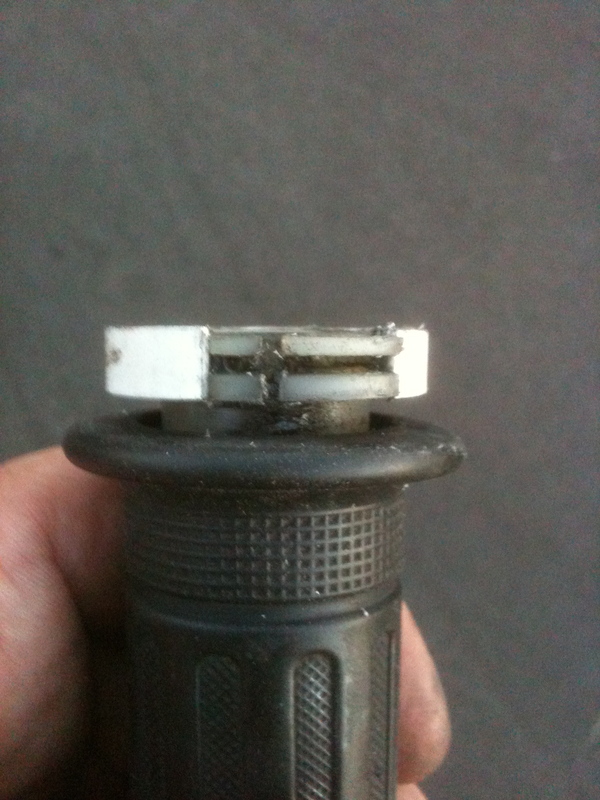 …But a thin slice of pvc fitted into the groove you see in this photo worked very well! The second problem involved the carburetor that came with the engine: It’s a 22 mm Mikuni, VM series, and it’s too freakin small. Adding insult to injury, it isnt jetted right, and attempts to cure the problem have been unsatisfactory. Other than jets, there seems to be a lack of tuning components available for the VM 22. Plus, tuning rules dictate that the carburetor throat size be at least the size of the intake valve, and the intake valve in the Lifan 140cc is 27 mm. So, the debate rages whether to live with the terminally lean midrange and strangled top end power or spend the bucks with Sudco and purchase the right size carburetor pre-jetted for the application. Kind of a dumb argument really, except that I’m not inclined to spend a bunch of money on what amounts to a trivial pursuit. Does Frank purchase the correct carburetor?